Rhythm sticks or clave (klah-vey)—a Latin name for rhythm sticks—are indisputably one of the best first instruments for young children. Rhythm sticks are members of the “percussion family” of instruments—which are musical instruments sounded by striking, shaking or scraping—and are tapped together to make a sound. Small percussion instruments are the most appropriate for children ages 2-7 and include the triangle, maracas, bells, tambourines, drums, cymbals and sand blocks. 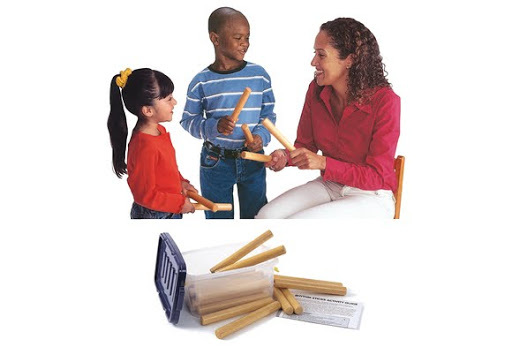 Rhythm sticks are a natural extension of the sounds children make with their hands (clapping) and feet (stamping). Basic rhythmic concepts about beat, tempo and patterns are great for teaching to young children and can be experienced through a variety of fun activities, including playing rhythm sticks. When rhythm sticks are used in musical activities for young children, the process, rather than the product, is the important goal. Children thrive on the familiar; they enjoy the security of repetition and it’s an essential component for building basic skills and understanding. It is important that rhythm sticks for the 2- and 3-year-olds be the appropriate size. Chunky Rhythm Sticks from Discount School Supply. are specifically made for little hands and fingers to easily grip and hold. This set includes 24 sticks or enough for 12 children with one for each hand. It is helpful to establish rules that will make the playing experience a happy and enjoyable one for both adults and children. As the teacher or leader of the activity, do not pass out the rhythm sticks until you have made clear what your expectations are regarding use of the rhythm sticks. The teacher or leader should demonstrate the activity first. If a child does not use his or her sticks properly or safely, an appropriate consequence might be to take them away for a short period of time, allowing that child to observe and rejoin when he/she feels able to follow the rules. 1. Children sit cross-legged in a scattered or circle formation, ensuring that each child has his or her own personal space. 2. An adult or class helper is the keeper of the bin of sticks and walks around the group to allow each child to pick two sticks. 3. Rhythm sticks are passed out and children lay them on the ground in front of them and put their hands in their lap. 4. Upon teacher or leader instructions, or when the music starts, children can pick up their sticks and follow your lead. 5. When the music stops or the teacher says “freeze” and all activity ceases. If children are sitting, the sticks go back on the ground and hands go in their laps. 6. For organized clean up, an adult or class helper brings the bin around and instructs the children to put the rhythm sticks in the bin. Pass out the rhythm sticks—, have children practice following a leader as they keep time to the music. Ask the children to stand up and get ready to march (a precise type of walk, accompanied by lifted knees and swinging arms) in the rhythm stick band! The teacher or a child can be the leader of the parade who marches in front, setting the direction and pace of the parade. Select a musical selection with a short, regular beat for a melodic and rhythmic background to accompany the sticks.